You are here: Home / Posts / Join the November Room Makeover Challenge 2017! Join the November Room Makeover Challenge 2017! Each year my readers and I do two of these room makeover challenges. These challenges are about regular ‘ole folks like you and me. You’ve seen the bloggers whose homes look like they belong on the cover of Better Homes and Gardens. Well, you ain’t gonna find that here, honey. ? My home, as much as I hate to admit it, is in need of a lot of DIY and decorating help, just like my readers’ homes. I started these challenges so that we could all band together and tackle one space together. Not to create a cover of Better Homes and Gardens. Instead, to create a space that’s clean, comfortable, and cozy, without the expense or the talent that a cover-worthy home may require. You can consider these 30-Day challenges as the challenge for regular folks that just need a swift kick in the pants to turn their homes into something great! 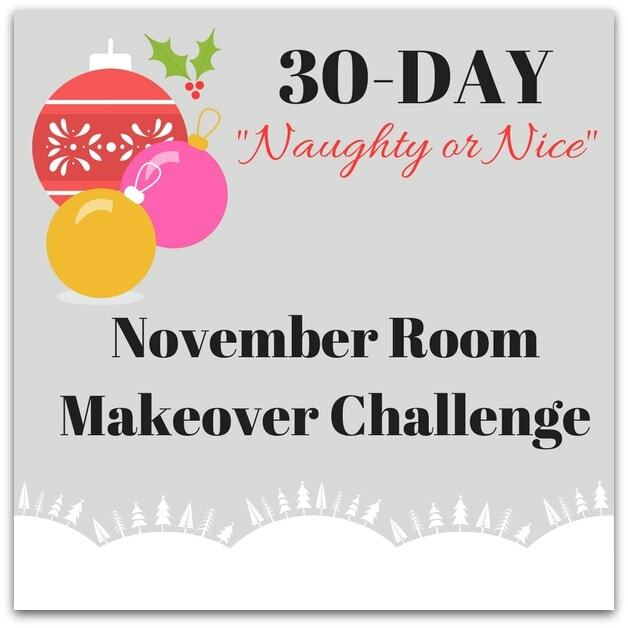 Welcome to the 30-Day “Naughty or Nice” November Room Makeover Challenge! Now sign up and go check your email! I’m in. Cheating a bit as this has been in the planning stage for months, I actually started working in there October 22 and declared it mostly finished November 20th. Garage. Version 3.0. I will be digging out my living room/home office. Over the past two years, my living room has disappeared as it became swamped with all the “this will sell on e-bay/etsy” finds at estate sales. I’m a great picker, not so great a seller so I hope having publically committed will give me a push to at least find the sofa! Dining room makeover for the holidays! Nautical theme, inspired by your sea salt color by sherwin williams. I am chalk painting the dining table white. DIning chairs will get new gray upholstered seats. Walls will be sea salt color along with nautical themed decor. Thanks for the inspiration! Sweet! I love when people know exactly what they’re going to do! There’s no stopping you then. 🙂 Glad to hear you’ll be taking part, Iris! I will be finishing my basement bathroom that I started a few years ago and never finished. I will be relocating the sink to an adjacent wall because the previous sink was under a window that left no room for a mirror and the other wall is blank. The room could use better spacing. I purchased a vanity that needed some repairing, a top, back and legs it was $10. I already have a top with a sink that should fit on top, I used the legs that I kept from an old couch. The walls need some sanding and painting and I’ll need to figure how to deal with the door that was relocated by a friend who failed to move the light switch as well. Hey there, LaVerne! YAY! Glad you’re joining in! Complete Laundry Room make over. Started about 6 months ago. Need new ceiling tiles and paint old ones. Finish painting shelving, walls, paint and stencil floor, make a craft closet, organize storage area, paint old ugly brown frig. + Make it pretty so it can be my happy space. (At least, that’s the plan and I have already started. Thanks for the challenge and the kick in the pants. Just what I needed. The above space would not let me “Join the Challenge,” it said wrong value.?? Not sure what I’m doing wrong. But I definitely want to join challenge. I got a check mark, so I think I’m in! Hey there, Gigi! I checked the list and you’re on it! 🙂 YAY! Your laundry room will thank you!